Ho-Ho cakes and cupcakes have been my family’s favorite for many years now. I’m unsure as to where I got this recipe though. There were many times when I was younger, Baba (my grandmother) and I would sit at her long rectangle table and write out recipes from our favorite cookbooks, while we discussed food, of course! This was our process: read through cookbooks, go over menus for gatherings, discuss what we were going to grow in the garden, or leaf through cooking & baking catalogs circling our wishes. The original filling recipe called for 1/2 cup of Crisco and 1 stick of softened butter. In the past I have made it this way and it tasted fine. I prefer to bake with butter and if I can alter a recipe and it works, then yeah, to more real butter flavor! I found that I was able to sub the 1/2 cup Crisco for an additional stick of butter. The filling might look a little like cottage cheese at first, but it does whip into a fantastic cooked fluffy filling. 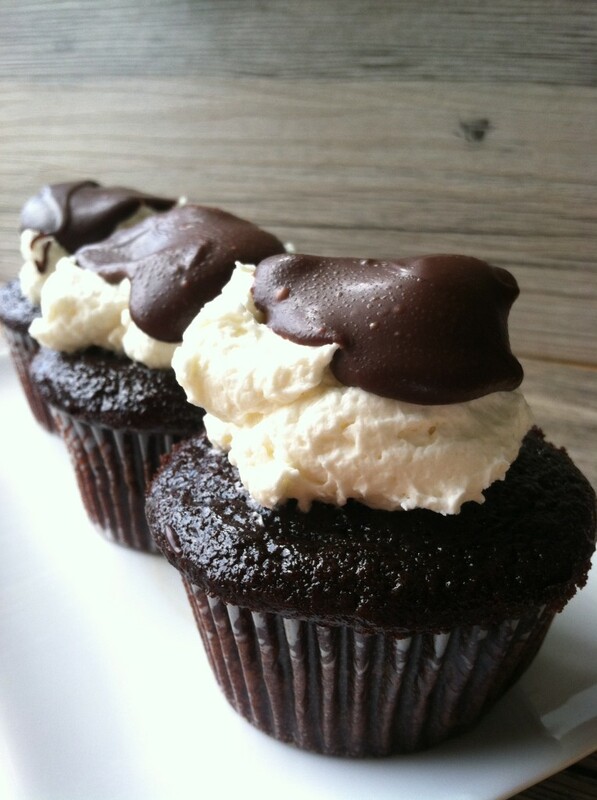 When the filling nests on top of the cupcakes they look like soft clouds before the ganache flows over the white fluff. This is when you carefully peel back the cupcake liner and sink your teeth into the three layers of heaven. This will certainly bring excitement to your eyes and your tastebuds will explode. You might even manage a few “OMG’s” as you stuff your mouth! 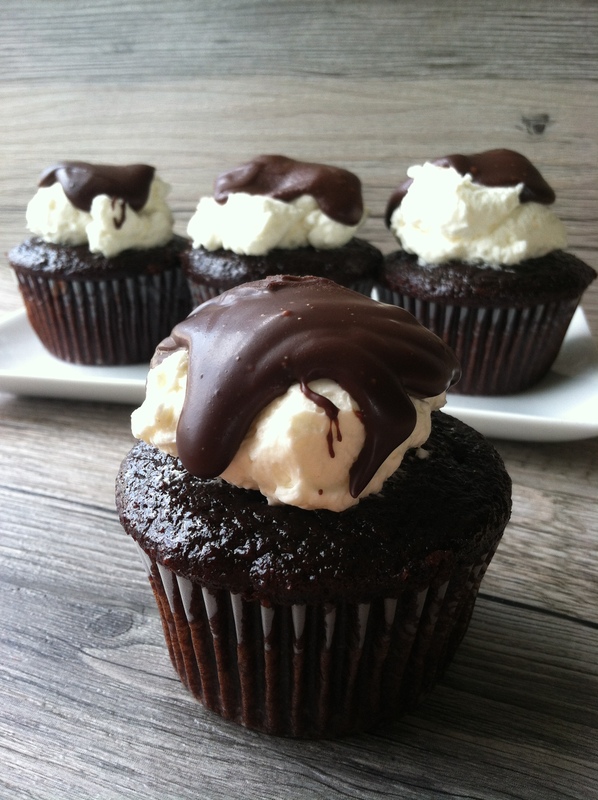 Choose your favorite chocolate cupcake recipe. Mine is the double chocolate cupcakes recipe, though in the past I’ve also used a chocolate fudge box cake. Once the cupcakes are cool, top with the filling using a cookie scoop, tablespoon or a pastry bag with a large circle tip. Lastly, drizzle the chocolate ganache to top. 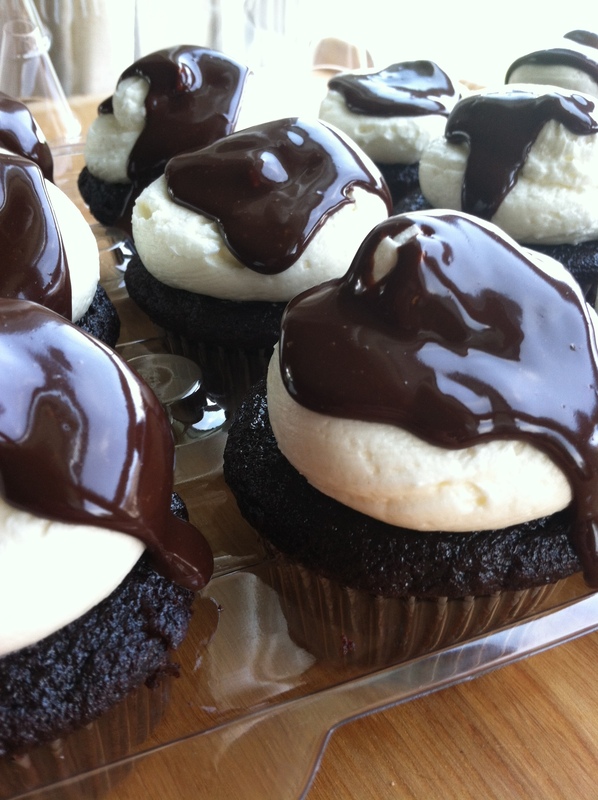 The finished cupcakes can be refrigerated to set the ganache or until ready. Once the ganache is set these are best served at room temperature. On the stove, add the flour to a saucepan. Cook over medium while slowly whisking in the milk, as if you’re making a gravy. Whisk the flour and milk until smooth and thick. Remove from stovetop once thickened. Let cool. The flour and milk mixture can be make in advance. Tip: Lay a piece of plastic wrap on top of the mixture so it’s directly touching the surface so it doesn’t make a skin. In a mixing bowl, add the 2 sticks of softened butter. With the paddle attachment, use a stand mixer to beat the butter until creamy. Slowly add the 1 cup of sugar. Continue beating until well combined. Add the room temperature flour to the mixture and beat on high speed until light and fluffy. At this point it is ready to be spread over your cake or cupcakes. It can be chilled if needed. Bring the cream just to a boil, stirring occasionally, in a small saucepan over medium heat; remove from heat. Put the chocolate in a medium heatproof bowl, and pour the heavy cream on top; let stand for 5 minutes. Gently stir until the ganache is smooth and glossy. Refrigerate the ganache, stirring occasionally, until slightly cooled and thickened, about 10 minutes (do not let it harden). Drizzle over the fluffy filling from recipe above. Tip: Depending on how thick or thin the ganache is, more chips or cream can be added to get desired consistency.